WILMINGTON, N.C. – Cape Fear Museum is proud to announce the award of a $1,915 grant from the Suzanne and George Taylor Endowment Fund, an endowment held with the New Hanover County Community Foundation, an affiliate of NCCF. Funds will be used to purchase nature-related play materials for New Hanover County’s Cape Fear Museum Park. Interactive natural components like stackable tree blocks, garden pot makers, a water play table, a tree trunk balance beam and giant tree cookies will offer families the ability to playfully explore the park and its natural elements. 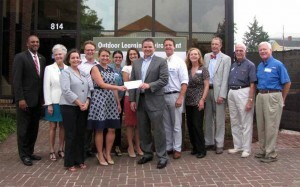 “We are grateful to the Community Foundation for their support. Having these components gives our youngest visitors the chance to explore open-ended materials that allow them to use their creativity and imaginations. It’s a great alterative to concrete and plastic!” Museum Education Manager Amy Thornton said. Opening on September 25, 2015 at the corner of 8th and Market Streets adjacent to the Museum, the park is an urban green space, free and accessible to the community. Its interconnected park-like landscape and interactive exhibits will introduce visitors to some of the ways that people have interacted with the region’s land and water resources through time and how these interactions have shaped the history of the Lower Cape Fear region. Visitors to the park can engage with hands-on exhibits, explore gardens featuring native and adaptive plants, learn about historic objects and images, and enjoy special educational activities. The park’s design encourages physical activity and learning through discovery, observation and play. The NCCF is the single statewide community foundation serving North Carolina and has made $89 million in grants since its inception in 1988. With more than $191 million in assets, the NCCF sustains 1,200 endowments established to provide long-term support of a broad range of community needs, nonprofit organizations, institutions and scholarships. The NCCF partners with 60 affiliate foundations to provide local resource allocation and community assistance in 67 counties across the state. An important component of NCCF’s mission is to ensure that rural philanthropy has a voice at local, regional and national levels. For more information, visit www.nccommunityfoundation.org.